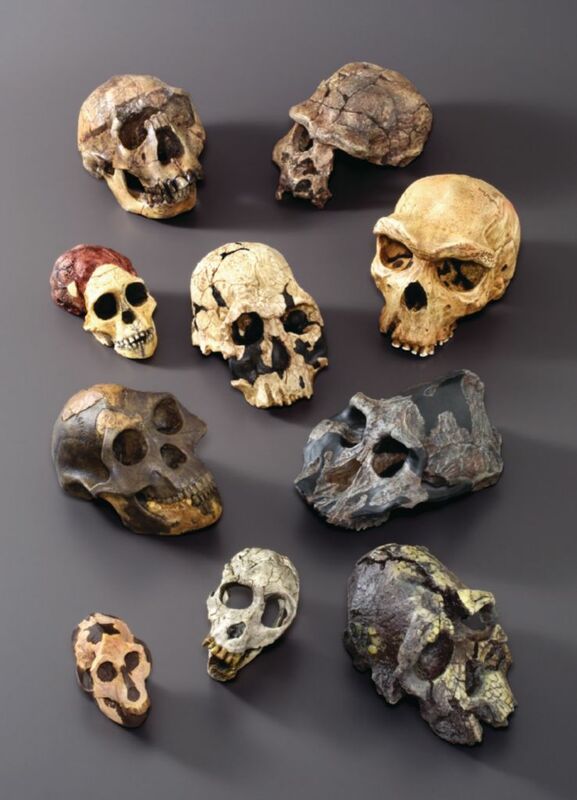 Each hominid was carefully researched and re-created in resin from casts that were made from the original fossils, the latest literature, and photographs, then color-coded to distinguish the original fossil remains from the reconstructed parts. Aegyptopithecus is believed to be an ancestor of Old World monkeys and hominids. Proconsul africanus lived in Africa approximately 14–23 million years ago. Kenyanthropus was discovered in 1998 near Lake Turkana, Kenya. Dating back 3.5 million years, this hominid challenges Australopithecus afarensis as the direct ancestor of the modern human. A. afarensis is dated at 3.2 million years old. This hominid fossil commonly known as “Lucy” has been considered to be the first human. A. aetheopicus is considered a prime example of ancient hominid evolution, even though it is not a direct ancestor of humans. A. africanus has been identified as a new, intermediary genus and species of hominid. Homo rudolphensis is contemporaneous and geographically concurrent with H. habilis. H. heidelbergensis (Rhodesian Man) is the first human ancestor found in Africa and is estimated to be about 300,000 years old. H. ergaster (“Nariokotome boy”) is the first set of remains dated before 100,000 years that is complete enough to determine brain size and whether or not language was possible. H. erectus (“Java Man”) was discovered in 1969 in Indonesia. You may buy each skull separately, or you can buy the set and save.